I can't remember a day since we've lived here that we haven't been grateful for the experience, and I suppose that fact alone puts us in some sort of elite company. This morning it was a Curlew or Curlew Sandpiper that escaped before I could get my camera onto it, but the pic from the steps was pretty nice in the early overcast light. If only I'd had a bigger lens, or a camera at the ready, or I'd got up earlier or.....does that sound like a grateful person to you?? Actually I didn't get it clearly identified, but it's almost certainly one of a variety of migratory birds which come down from Siberia to enjoy our Autumn, some of them stay, and I figure he's one of them. Can I do a Diana Fisher and say he is a big bird that comes in white? 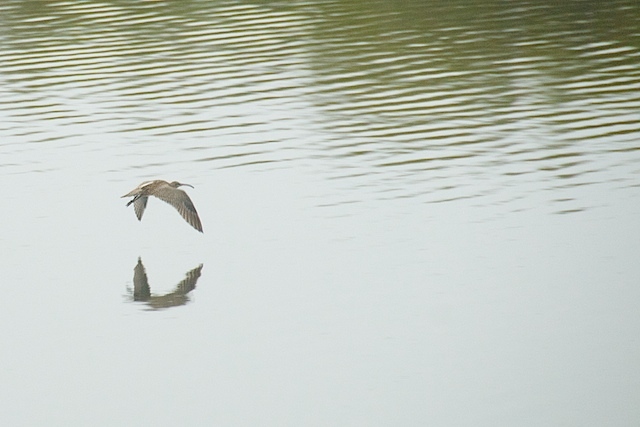 After consulting my copy of Simpson and Day I am very much of the opinion that the bird has been correctly identified as a curlew sandpiper. (non breeding) All of the other curlews have either a much darker and varied plumage or straight bills.